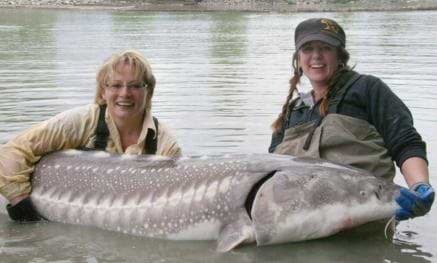 It's important to have a good fishing hole or two in your back pocket and I do. 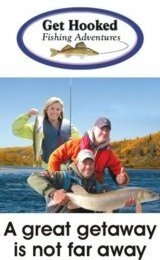 This is equally convenient in summer or ice fishing season as it allows me to bring friends out and pretty much be guaranteed some great action. I know where to go, what to expect, and how to fish it. 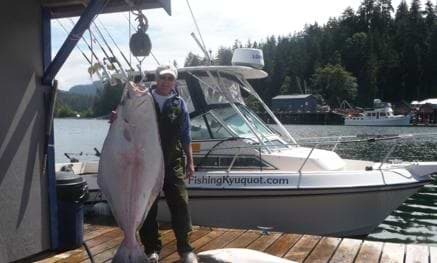 All that's required is the simple act of going out and the fish pretty much take care of the rest. 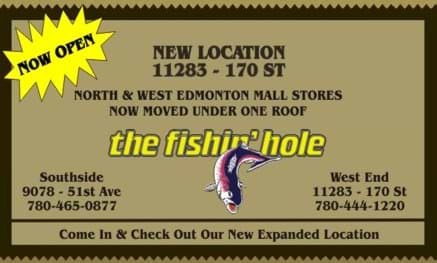 Who needs complicated and hard fish? Not me. Carson Lake and the rainbows that call it home is one such lake. Since first ice this winter trout fishing at Carson has been unbelievable and it has continued right through the New Year. I've had nothing but great fishing for rainbows. 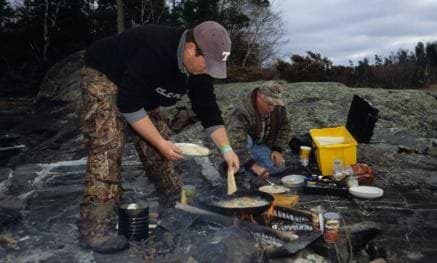 Some days were a little harder to cash in on the bite, but none were all that difficult. 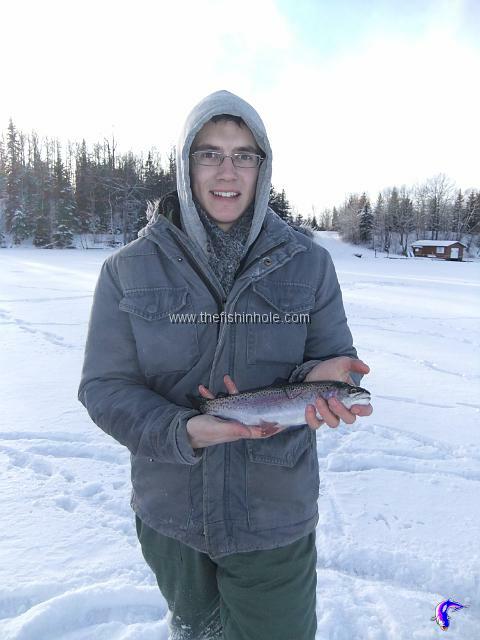 Carson, located near Whitecourt, AB, has been my most consistent trout lake by far. It has been pumping out rainbows like crazy. 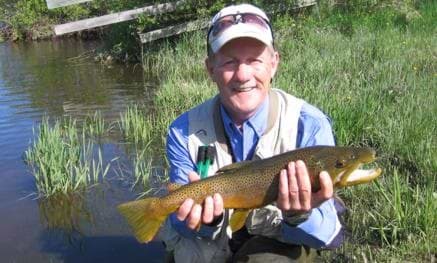 On an ordinary day I can normally bring home a limit of good sized trout averaging 12 to 15 inches, plus I'll have released a number of others. On my most recent trip to Carson, Adam, Fauve, Lukas, Chris and I couldn't keep the rainbows off our lines. 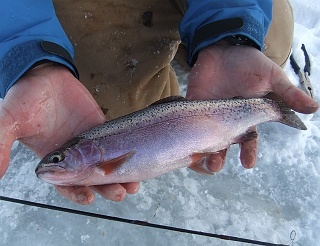 From the time we arrived it was steady bites and after two hours we had landed some 20 rainbows with a half dozen beauties on ice that were perfect for the frying pan. Pan fried winter trout with a little freshly squeezed lemon is a personal favourite. There is really no secret to catching Carson Lake rainbows. 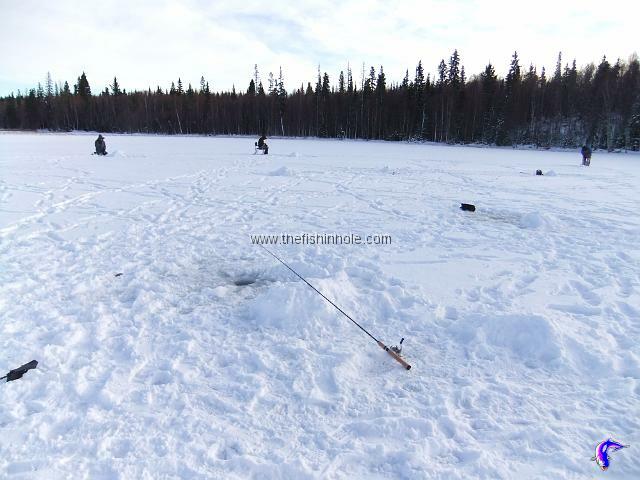 Drive yourself to the lake, drill a hole 50 to 100 meters in front of the expansive boardwalk. This is where most everyone sets up and sooner, rather than later, your rods will be bent with a scrappy trout on the other end. 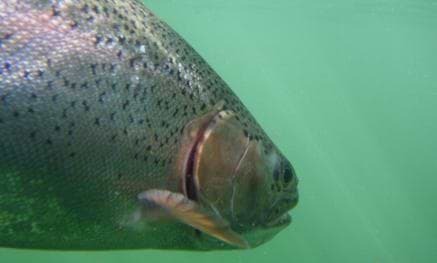 This is easy fishing and the list of effective baits or hooks I generally use are maggotts, trout worms, pieces of dew worms, small black jigs, bead head woolly buggers, bead head pheasent tail nymphs, and shrimp. 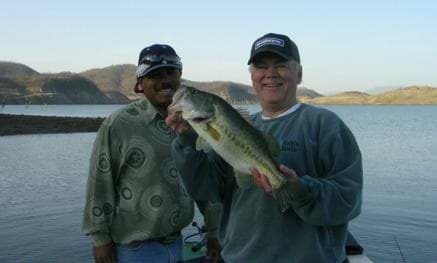 They have all worked well, with the bait slightly out producing the jig or the fly, but not by much. In the evening we usually get into a slightly bigger bite, so it normally pays to stay until the sun gets very low in the sky. 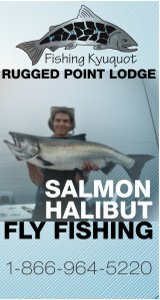 I have found that the set line most often out fishes the jigged lines. 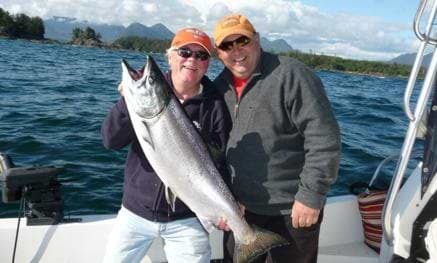 I fish over 14 to 18 feet of water when the sun is high and, as the sun gets lower the fish come shallower and so do I. It also seems that the fish have food preferences that differ from one day to the next. That is, one day they would be all over trout worms, while the next day they had a taste for maggots, or shrimp. Because of this, at the very minimum, I bring a container of worms and a bag of maggots with me and let the trout tell me what they want. 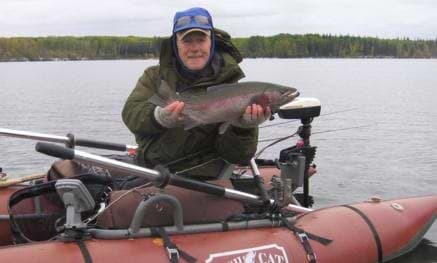 Carson Lake is a great trout fishery, but it is not the only great producing trout lake around. 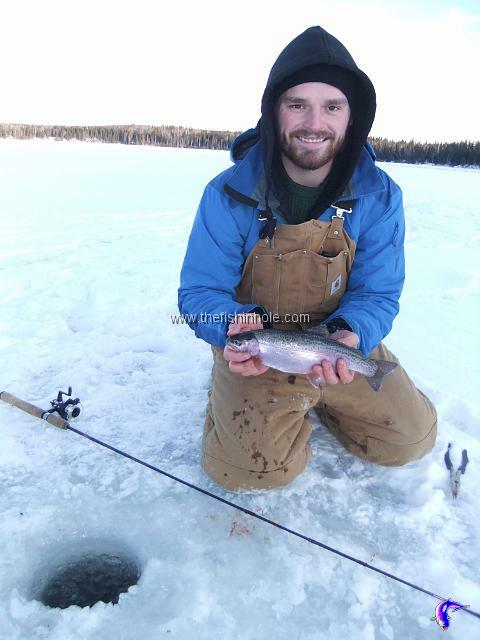 In my neck of the woods I have a number of stocked trout lakes that have been hot producers. All it took was getting familiar with a few of them and now I can pretty much be guaranteed good fishing most every time out. 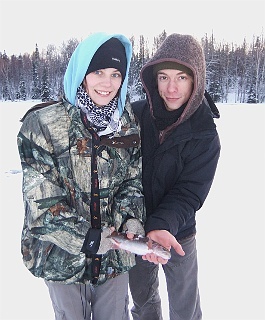 Good fishing and favourite lakes, however, is not limited to trout. 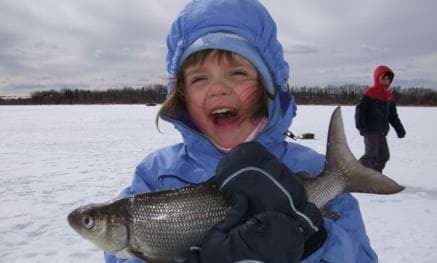 For example, Gull Lake can be counted on to offer up good fishing for whitefish. 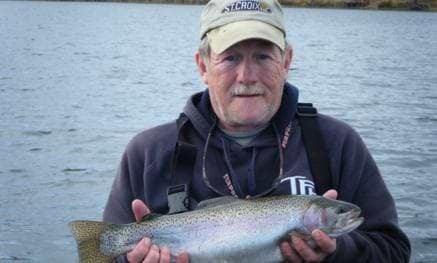 There I fish in about eight feet of water over weeds and use a wireworm, a very small marabou jig, or a fly slowly jigged from the top of the weeds to the bottom. 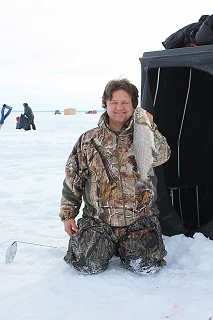 If I get to the lake for the morning bite I can pretty much count on whitefish for dinner. 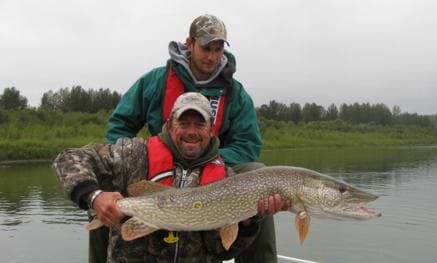 I also put out tip ups at Gull because the pike fishing is generally decent and the action gets better as we close in on spring. 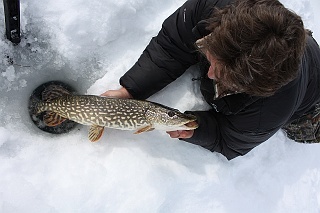 A windlass tip-up with a 5 inch anchovy set a foot off bottom will pretty much guarantee a bonus pike or two. 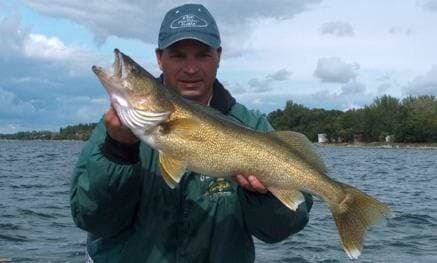 At other times I have a hankering to catch a walleye. That means a trip to another favourite, Pigeon Lake, where good walleye fishing is all about finding a drop off. 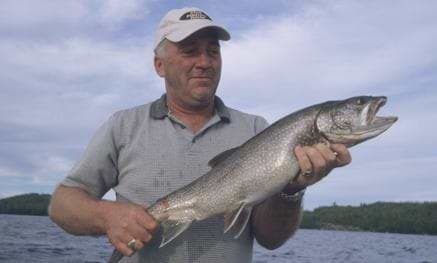 The walleye will be on or near this drop off all day, with a pronounced bite in the morning and again in the evening. 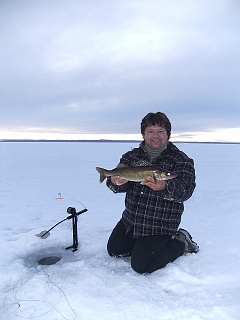 Much like the Carson Lake rainbows, walleye will be deeper during the day, moving up onto the shallows in the morning and the evening. 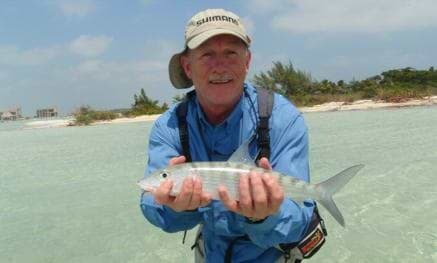 A tip up with an anchovy is a great bait choice while I jig with my main line (2 lines are allowed in Alberta). 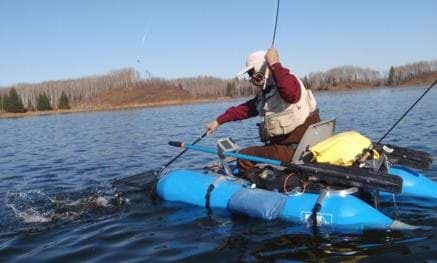 The tip-up will also pick up any pike or burbot that happen to be around. With the main line I love slow jigging a glow jig tipped with a minnow. I drop it to the bottom, then slowly lift it an inch or two above and just hold it there. 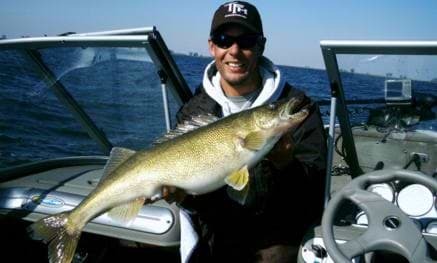 If there's a walleye around, in short order there will be that tell tale tug on your rod and the fight is on. 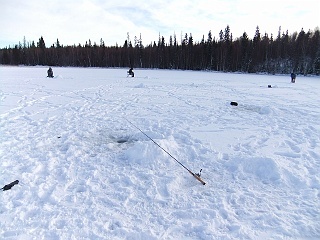 So there it is, three of my favourite ice fishing lakes. They have become my favourites because they provide a diversity in fishing opportunities, they are not too far from home and I visit them often enough to know what's going on and how to catch fish. Where ever you may live, I'm confident there are a number of lakes near you that, if given the time to get to know them, will produce well and become your favourites to.